Looking for a handmade gift idea the kids will love? Ever wish to pay tribute to our amazing rescue workers? Need a crafty weekend project?? 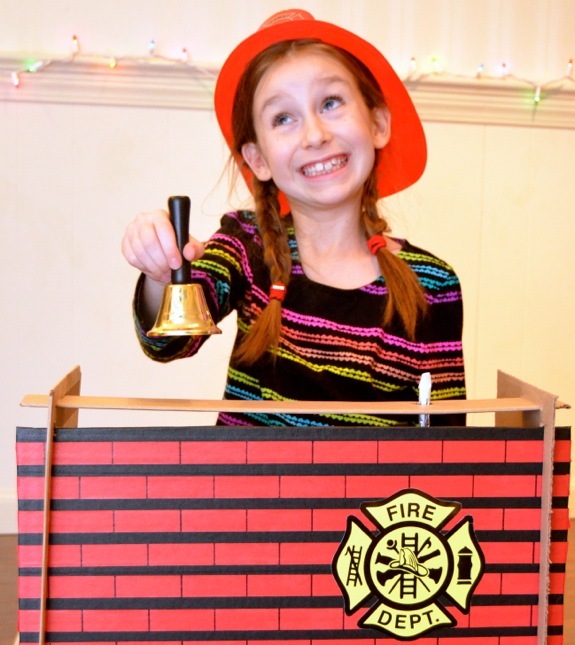 I made a cardboard firehouse for the kids last weekend, intended as a handmade Christmas gift, but… well… I just could not wait that long! It was a HUGE hit! 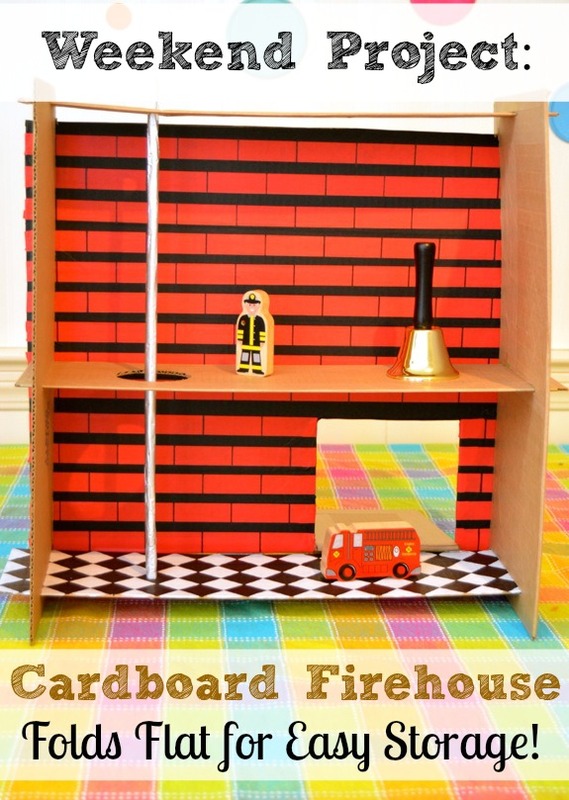 Thanks to a recycled moving box and a quiet weekend at home, this pretend firehouse inspired days of imaginative playtime fun. To make one of your own, you will need a large moving box, a quality box cutter, and a crafting scalpel. If you’re just beginning to work with cardboard, you may want to read this post on 7 Tips for Crafting with Cardboard. 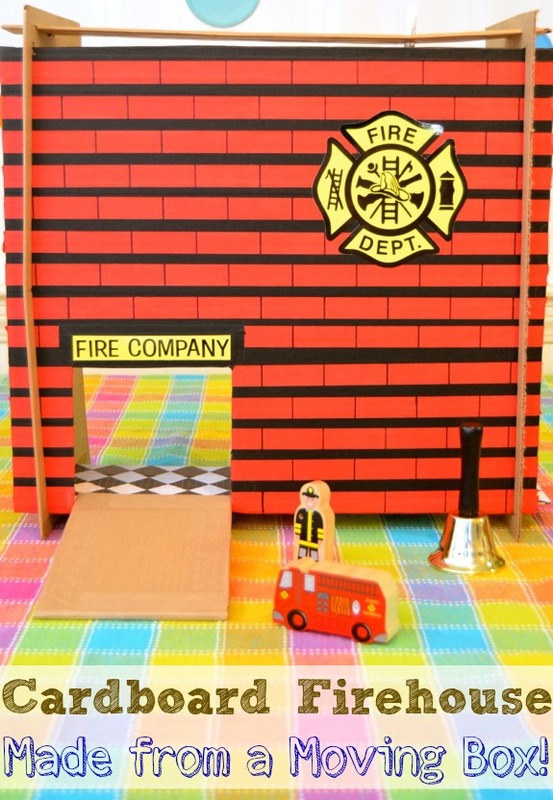 One large moving box provides enough cardboard to make two firehouses, and can be taken apart to store completely flat. Yay for toys that don’t take up a lot of room when they aren’t in use! The piece in the photo below with slots cut out — you will need 2 of those (one for each side). 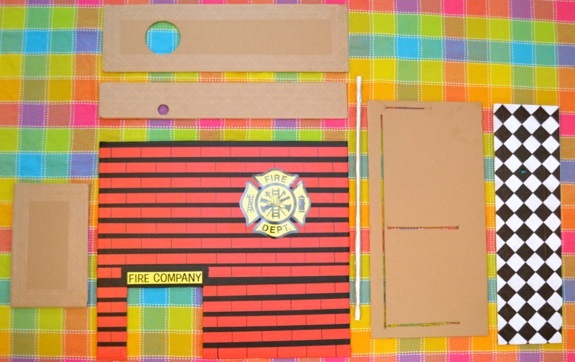 The front of the firehouse was decorated with colored masking tape and a permanent marker, and the signs were printed on photo paper and glued to the front. The bottom floor was painted to look like a checkerboard, and the pole was made with a wooden dowel (wrapped in aluminum foil and then clear packaging tape). I chose to leave the other sides plain, and the kids have plans of their own to decorate them! They are already planning to make their own furniture and create a landing pad on the roof for the helicopter — FUN! Right now, they are just too busy playing (and I don’t blame them)! Our firefighters were busy putting out fires, saving people from burning buildings, and rescuing cats from trees. Hard at work! 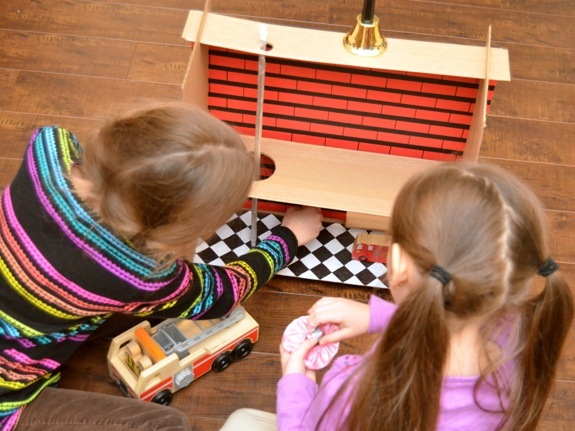 I love frugal projects like these because the kids enjoy playing with them so much! 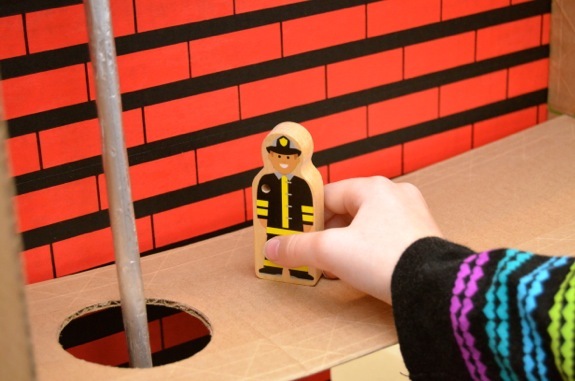 They already had a play fire truck (it comes with firefighters too), but I also adore the look of these peg doll firefighters if you would like to make some of your own. I wish you could have seen the look on the kids’ faces when they woke up to see this “invitation to play” waiting for them on the kitchen table the other morning. Pure joy!! Mark’s comment made me giggle. Your girls are so very lucky! Awesome!!! I can’t wait to do this. Thanks for sharing! I love it! I’m horrid at cardboard creation, so I always watch posts like this in jealousy. Of course it’s not like my kids care. They’d happily take a plain box and destroy it…….. I mean create with it. I love cardboard toys for kids. They have a great time … even more so than with plastic or electronic toys. They can make it and then when they are done with it weeks later, you don’t feel back recycling it! This looks AWESOME! Thanks!